Consists of four Super Adjustable 2™ Super Erecta wire shelves 5" (127 mm). Resilient rubber or polyurethane casters with donut bumpers. 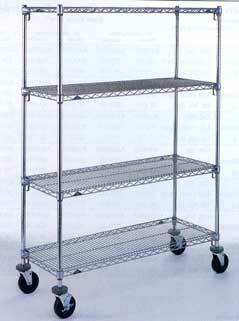 Super Adjustable 2™ Super Erecta shelves allow for quick and easy adjustability. Open-wire shelf design minimizes dust and increases air circulation and visibility.